We'll get you kicking up your heels and having a great time! The Alaska Blaskapelle is based in Anchorage Alaska and plays just about anywhere in the state. Oktoberfest season will find the band playing up in Fox (north of Fairbanks) to Homer, 600 road miles south with many points in between. Another annual event is the Alaska Rail Road and Nordic Ski Club's "Ski Train" in February or March. With 12 to 15 players at a time, and as many as 25 musicians on-call, the Alaska Blaskapelle can actually be in two places at once! 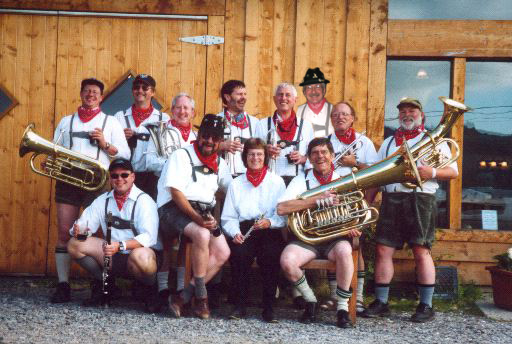 Playing traditional German music in the Bavarian style, the Alaska Blaskapelle is sure to liven up any party or event. Go to the contact page to get in touch with the manager, ask question or book the band for your event!